Speaking to young people openly and honestly about topics such as dying, death and bereavement is at the forefront of a Hospice initiative. 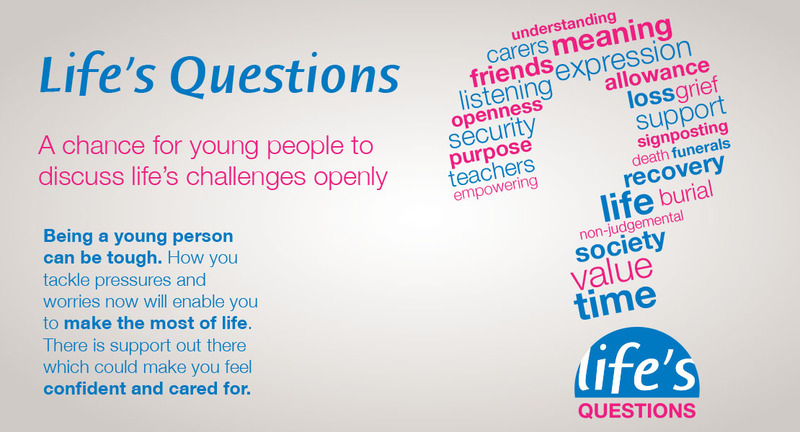 Life’s Questions gives young people the chance to discuss life’s challenges openly by recognising that children need to have the opportunity to talk about difficult subjects such as death, divorce, loss and grief. The hope is that Life’s Questions will help build their resilience now and in the future. It was a visit to a school in May 2017 that prompted Hospice Educator Lisa Patterson to come up with the idea. She wanted to bring the topics adults can often find themselves shying away from into open conversations with young people. Lisa explains: “I suppose it all started when I was asked by a school to go out and deliver some training and share my experiences with their health and social care students. “During a session at one of the schools, I asked the students if any of them knew about the Hospice and some of them did. They then started to bring up past experiences and even though some of them were getting quite upset, they wanted to keep sharing things about their experiences and the people they had lost. With the support of the Hospice’s Education, Chaplaincy and Orchard Teams, she then planned a pilot session. With the feedback, showing a need for Life Question’s Lisa began to drive the initiative forward. She soon had invitations from schools who wanted her to come in and speak to students. “It is very much about getting them to recognise that everyone is different and that everyone copes with things in different ways that everyone is an individual and that’s okay. The sessions are about being non-judgemental. We talk about different kinds of loss, not just death, but perhaps people moving away or families splitting up. “The most important messages we try to get across are that it is okay to talk about these things and the feelings they have, and how it is important to listen to others when they talk about them,” added Lisa. Life’s Questions has also been modified so it can be presented to larger groups. Lisa said: “For me, I think the most important thing is that we are giving young people a voice. It is almost as if Life’s Questions has told them it’s okay to talk about the subjects that they might have perhaps felt uncomfortable talking about before.